If you have COPD, regular exercise can help you feel better and breathe easier, reduce the risk of COPD flare ups, and maintain strength and endurance for everyday tasks. Some common aerobic exercises you can do are walking, cycling, and swimming. It is very important in helping you to keep well. It should be an important part of your day, even though you may get breathless during activity. By including physical activity in you day, your muscles, joints and circulation will become more efficient and your body will use oxygen better. It helps you take control of your condition. By getting fit you will also become less breathless. Physical activity should be a pleasure, so you should choose something that you enjoy. Aim to do 20-30 minutes of physical activity a day, 3-4 times a week, taking breaks in between exercises when necessary. Walking, swimming or riding a bicycle may be enjoyable ways to exercise both your upper and lower body. 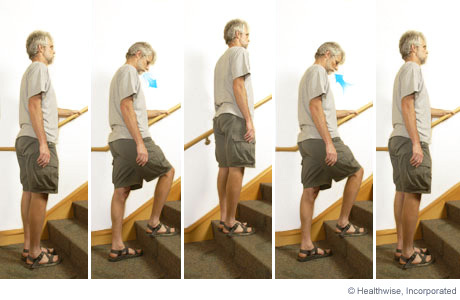 Regular walking is one of the best exercises that someone with COPD can do. Begin any program at a comfortable pace, which enables you to control your breathing and talk if you want to. Start with a short distance initially, with as many rests as you need. Mild to moderate breathlessness will not harm you. The exercises below may be done sitting or standing. 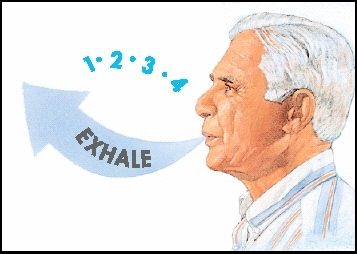 Time these exercises to suit your own rate of breathing. If you get breathless rest in a position with your shoulders supported and wait until the breathlessness eases. If any of these exercises causes you pain you should stop and get some advice from your physiotherapist. 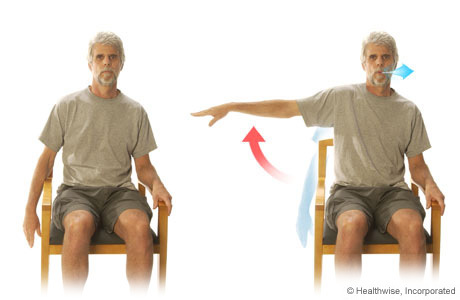 Elbow circles - Sit or stand with your feet slightly apart. Place you hands on your shoulders with your elbows at shoulder level. Circle your elbows forward, up and out. Breathe out as the elbows move forward and up and breathe in when returning to starting position. Arm raising – Begin with arms relaxed along the body. While breathing out, lift the right arm up to shoulder level, keeping it straight at 90 degrees. Return the arm to the starting position while breathing in. Repeat it with the other arm. Leg lifts – Sit with your feet slightly apart. Lift one leg up, keeping the knee bended at 90 degrees, as you breathe out. Breathe in as you return you leg down. Knee extensions – Sit with your feet slightly apart. Straighten one knee as you breathe out. Breathe in when bending your knee to the starting position. Step ups – Find a small step near something you can hold on to. Breathe out as you step up onto a step. Breathe in as you step down. Occasionally change legs. Sit to stands – Sit in a chair. Slide forward as far as possible. 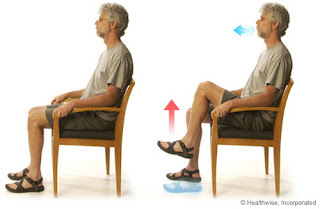 Move your feet back so your heels are lined up with the front edge of the chair. Lean well forward (nose over toes). Push down and drive through your legs to stand up. Lightly use your hands on the chair if necessary. Breathe out as you stand up. Do five to ten repetitions, two times a day. Push-ups – Stand with your feet wide apart and place your hands on the wall at shoulder, about 30’’ apart. Do a push towards the wall, keeping your back straight as you breathe in. Push away from the wall to the starting position, while you breathe out. Side Bend – Place your right arm across the body, with the left hand on right lower ribs. While breathing in bend over to your right, dropping the right hand towards the floor. 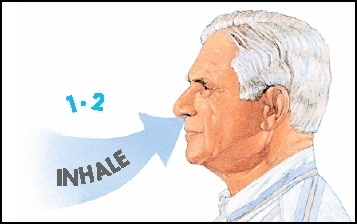 Breathe out as you return to the starting position. Repeat the exercise to the other side. Hand behind head – Stretch the right arm above the head. Bend the right elbow, lowering the hand to the back of the neck. Then, straighten elbow again to the starting position. Repeat three times, and then do the same exercise with the left arm. When the exercise is already too easy doing it, and doesn’t leave you breathless, you can increase the difficulty of the exercise by adding extra weight. I recommend adding 0.5 Kg at a time, but before doing it so it is better to ask you physiotherapist, which is the one who knows best your condition and what are you limits. Other exercises you can include are stretching exercises (triceps and pectoralis). For the triceps, pull your elbow behind your head until you feel the stretching. Hold 30 seconds, and then repeat with the other elbow. For the pectoralis stretch, hold on to a door frame with your arms at shoulder level. Lean forward until you feel the stretch on front of your chest. Alternatively, clasp your hands behind your head, and have a partner to pull your arms back until the stretch is felt. Hold 30 seconds. Perform each stretching 3 sessions per day, and repeat 3 times each session. Remain in these positions until you can catch your breath. 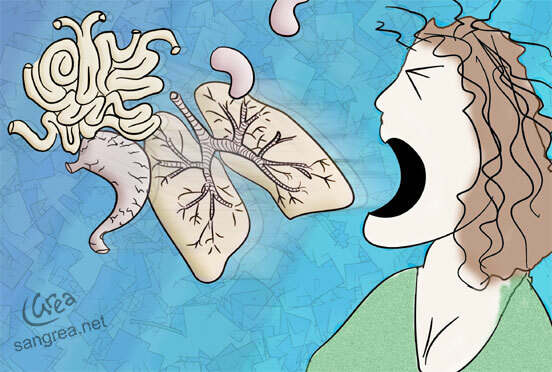 COPD may cause you to have too much mucus which can block your airways and make breathing difficult. This is why getting rid of unwanted mucus is important.